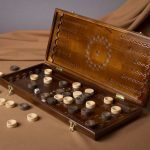 Backgammon Glossary: There are already a lot of very good resources on the web listing all the backgammon termsand jargons. 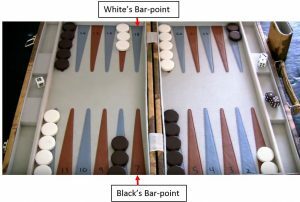 But I want the readers of GamesOfTradition to be able to refer easily and quickly to this backgammon glossary when they want to. To accept the doubling cube from your opponent and agree to play at with a stake as twice as the present bet. The player first point in the home board. This is a situation late in the game when a player has one or more of his checkers on his opponent’s ace point. The player is aiming to hit his opponent blot as he comes into his home board or begins to bear off. When the roll of the dice is 1 and 2. 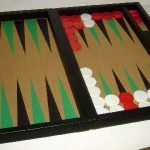 A variant of backgammon in which the roll of 1 and 2 gives the player extra turns. It is a type of strategy intended to provoke an exchange of hits. This normally occurs after the rival player escapes with his runners (furthest checkers). A checker that is totally free and in a position from where it can be used to make another point. A secure point made by a player into an opponent home board in point three, four or five. It is a very strategic position as a safe spot to land on from the bar when one of your checkers is hit; a good position from which to strike at your opponent’s checkers in his outer board area; very important for avoiding being primed by the opponent. A poor roll that fails to hit a blot or can’t be used for creating a point. A point occupied in the home board by two or more of opponent’s checkers. Under certain rules, an automatic doubling of the value of the game, occurring when both players roll the same number on the first roll of the dice. Usually, the rule of automatic doubles is limited to a single time each game. This rule has for effect to increase the stakes randomly, which adds to the excitement of gambling for some players. A defensive strategy employed by a player who is usually behind in the race but has numerous anchors into the opponent’s home board. The idea is to anchor as long as possible and prevent the other player to bear off his checkers or at least to bear off awkwardly. With this strategy, your opponents will expose his checkers to a hit. A game of backgammon in which the winner bears off all of his checkers while the losing player still has one or more checkers on the bar or in the winner’s home board. The winner receives three times the value of the doubling cube. That’s why a backgammon is sometimes called a triple game. 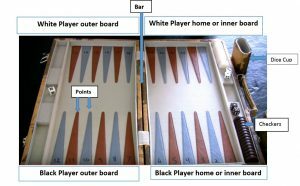 The raised dividing line where blots are placed after being hit, usually, a divider that separates the home boards and outer boards of both players. Checkers are placed on the bar after they have been hit and stay there until they re-enter the game. Moving your checker into your home board prior to bearing off process. Removing a checker from your home board by rolling a number that equals or exceeds the point on which the checker resides. The bearing off process can only start when all you 15 checkers have been brought in your home board. A game strategy in which a player hits his opponent aggressively and repeatedly in the own home board in an effort to close out his opponent and keep him on the bar while he is trying to close all his home points. A point occupied by two or more checkers on the home board or the outer board. The block hold back the opponent’s progress around the board. A single checker vulnerable to being hit by your opponent. Consecutive points aimed at preventing the escape of the opponent’s runners. The best type of a blockade is a prime. A rule used in money game and Chouettes, but never in match play. If a player doubles and the other player accepts the double, he can double again immediately (by saying”Beaver”) and keep the possession of the cube at the same time. The opponent may only do this as soon as the player is doubled. When a player says “beaver”, the opponent can accept the redouble and the game continues at quadruple stake prior to the double. If the player rejects the beaver, then the opponent loses the game with the current doubled stake. When a player has a higher pip count number than his opponent. When a player mistakenly plays the roll of 6-5 from the opponent’s one point (his own 24th point) to his mid-point (13th point) without seeing that the opponent has made his bar-point (point seven) and blocks your way. Moving checker from a point that contains only two checkers on it and leaving a blot (vulnerable). To break or open some of the points in a prime. One of the 15 playing pieces that a player move around the backgammon board.Sometimes called pieces, stones, men or even counters. The situation under which the players still have some of their checkers remaining which have not passed those of his opponent; there is still a chance of hitting or blocking in a contact game. To make a block on a single point, to add a second checker to a blot. The first game in a match wherein one player is within a single point of winning the match. It is in this game that the Crawford rule applies. A rule used in a match game, invented by John R. Crawford which prevents the doubling cube to be used by the players for the first game after one of the player has reached a score within one point less of the victory. Moving a checker from one quadrant to the adjacent quadrant. The total number of crossovers needed to move all the checkers into the home board and then bear them off. A position where your opponent has one or more checkers on the bar while you made all six points of your home board. This will prevent your opponent from reentering his checkers until one of the closed points in the home board is opened. The result of a roll of dice that don’t allow you to reenter a hit checker because of a blocked points on the other player home board. A checker which is located deep into the home board where it has no use for hitting or blocking points. During a match, a doubling cube that has reached its highest value.There is no need to make doubles anymore since the current value wins the match. Specific dice numbers that can’t be played by any of the player’s checkers in any current position. A player that refuse a doubling offer from his opponent. An anchor on the opponent’s first or second point. A leather, plastic or wood container which is used for shaking, tossing and rolling the dice. The purpose of using a cup is to prevent any dice manipulation. Doubling the stakes of the current game by a player that offers the doubling cube. A dice roll in which both values are identical, e.g. 1-1 or 6-6. A six-sided cube a bit larger than a die which is not rolled, but has 6 sides each one with a different number of 2, 4, 8, 16, 32, and 64 and used to track the stakes of the current game. The phase of a game which starts when one of the players begins to bear off. The number of points you’d expect to win or lose from a specific position if that position was played out an infinite number of times. A blot within a range for a direct hit by the opponent. A slang term for failing to enter when you have pieces on the bar (dance means exactly the same thing). A Greek variant of the backgammon game. Fevga is similar to the Russian Narde and the Turkish Moultezim. 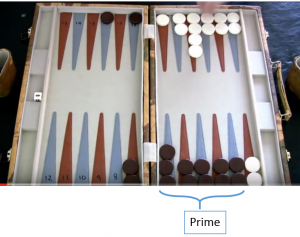 First International Backgammon Server, an online platform for providing players with human opponents. A prime of six consecutive points that completely blocks the other player from moving checkers across the prime. A game in which one player removes all his checkers before his opponent can remove any, and counted as a double win. One’s opponent’s five-point, useful for preventing primes when it is occupied by two of one’s own checkers. To move onto a point occupied by an opposing blot, and move the opposing checker to the bar. The portion of the board containing points 1-6. The checkers need to move here before they can be borne off. It is also the part of the board where the opponent’s checkers are re-entered from the bar. A rule which permits gammons and backgammons to count for double and triple stakes only if one or more players have doubled during the game. 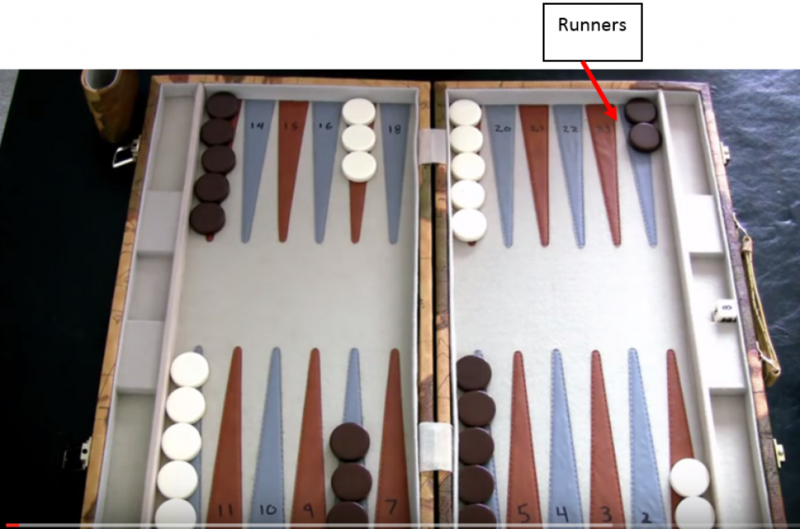 A series of games of backgammon, played until one participant reaches a predetermined score. Either of the two points furthest from the bar; the 12-point or the 13-point. A match score expressed in terms of the number of points needed by both sides to win the match. For instance, ‘2-away/4-away’ (or: -2/-4) could indicate the state of seven-point match in which one party has gained five points and the other side three points. 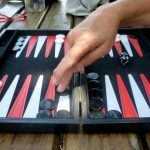 In backgammon, the common way of describing the movement of checkers involves numbering the points around the board from 24 to 1 such that the numbers diminish when the checkers move towards the home board. This implies that a reverse numbering applies when the opponent is on roll (with the 24-point now referred to as the 1-point, etc.). A move of a single checker is indicated by the start and the end number separated by a slash. If a move results in a checker being hit, this is indicated by adding an asterisk to the number on which a checker was hit. 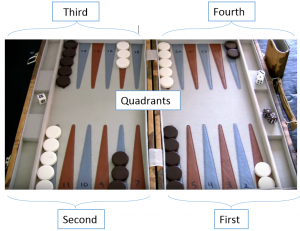 A variant of backgammon with no doubling cube, no bonus for gammon or backgammon. A point with one or less opponent’s checker.An open point is a point a player can move his checker to. To hit an opponent’s blot and then move the same checker to a safety by using the number of the second die. One of the markings on the face of a die, corresponding to a movement of one point. The total number of remaining pips needed to bear off all checkers. One of the twenty-four narrow triangles on the backgammon board where the players’ checkers sit, or the value of a single game of backgammon before accounting for the doubling cube, or a gammon or backgammon. Several consecutive points held by a player. An opposing checker trapped behind a 6 points prime cannot escape until the prime is broken. One-quarter of the playing area on a backgammon board. The first quadrant comprises a player’s points 1 to 6, the second quadrant points 7 to 12, the third quadrant points 13 to 18, and the fourth quadrant points 19 to 24. A game in which there is no longer contact. To double an additional time; after one player has doubled, a subsequent offer by the other player constitutes redoubling. One of the two checkers that began the game on the opponent’s one-point. Usually a good strategy to escape those checkers early in the game. To break up two checkers which are together on a point and leave them as blots.